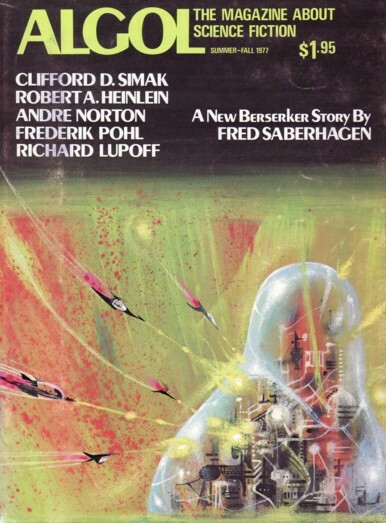 "Andrew Porter Editor & Publisher"; "Richard Lupoff Book Editor"; "Vincent DiFate, Frederik Pohl, Susan Wood Contributing Editors". Vol. 14, No. 3, Whole #29; ISSN 0002-5364. P. 3 features the table of contents and the art credits. All interior art is black & white. The appreciations of Simak by Heinlein and Williamson are embedded into Simak's acceptance speech for the Grand Master Nebula. P. 22 has five stills from the movie "Star Wars". There are numerous ads; pp. 2, 4, 8, 14, 18, 21, 26, 32, 34 & 35, 36, 45, 46, 65, 67 and 68 are pure ad pages. 58 • Letter (Algol, Summer-Fall 1977) • essay by Harry Warner, Jr.